Arequipa - Rodríguez Ballón International Airport is one of the largest and most important commercial airports in the South American Republic of Peru. 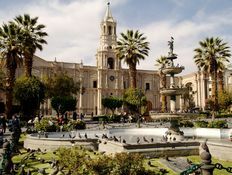 Regular scheduled flights for example serve Cuzco, Santiago de Chile or the capital Lima. The airport is on the northern edge of town about 8 km or 5 miles from downtown. yes; paid short and long term parking for about 300 vehicles.